This popular syrup has the authentic taste of Italian Amaretto liqueur. Enjoy this almond flavour in coffee, tea, desserts and many more recipes. Be creative and see what winning flavour combinations you can come up with. Only made with the highest quality ingredients, you can rely on this syrup to give you a premium taste every time. Ingredients such as pure cane sugar are what makes this product gourmet and a fantastic addition to your menu. Expand your choice of beverages for customers and create some excitement by adding this flavour option. From lattes, cappuccinos, americanos, teas and much more. The possibilities are endless and baristas and customers will love trying this product in their favourite drinks. Does Amaretto Syrup have Alcohol? The classic Italian liqueur does have alcohol content. However, this Amaretto syrup has zero alcohol content. The almond flavours are too delicious to resist, so this product is the perfect way to enjoy it without the alcohol content. It is a family friendly product that everyone can enjoy. Impress your guests by adding a splash into their beverage or indulge by yourself to feel extra cosy. The Spruce tells us that the Italian liqueur was created in 1851, after the Lazzaroni family of Saronno had made almond cookies for the king since 1786. It was originally made from an infusion of the cookies and a little caramel for colour. 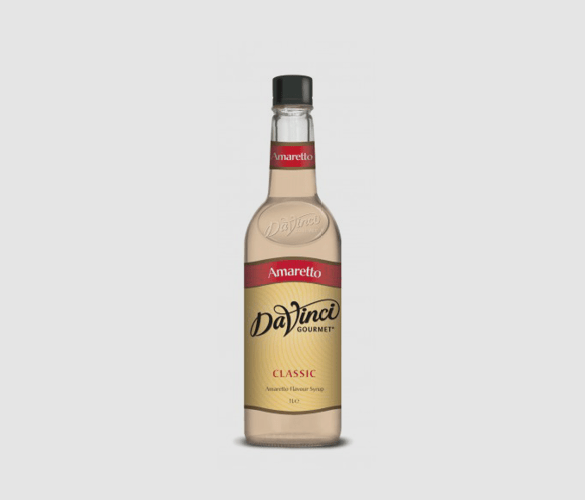 Now, amaretto flavour is so many products as the flavour is so delicious! Sweet almond and juicy apricot are blended to produce the honeyed taste of this syrup. This indulgent recipe is a healthier alternative to other latte recipes as it has a low sugar content. It is easy to re-create and will make you feel like you’re sat in an authentic Italian café. Mix together all of the ingredients except for the milk in a mug. Steam your milk. If you don’t have a steamer, you can simply shake the milk in a cup with a lid and then put in the microwave for a few seconds to stabilise the foam. Pour the frothy milk into the mug. Finish with your choice of toppings (we recommend whipped cream and a dusting of chocolate) and enjoy!